We are THRILLED to announce the initial list of incredible leaders from around Canada and the world who will be attending the Experience Your Life Expo on 29th September 2018 at Novotel Mississauga. We are proud to be a forum that brings together role models that represent the upper echelons of the business and public sector organizations. More importantly, these are individuals who have achieved great success without losing sight of the important things in life such as giving back. We are also excited to share that these executives are flying in from around Canada and around the world which demonstrates their commitment to youth empowerment. The breakout sessions are designed for a deep 40 minute conversation as opposed to a presentation which makes this a truly empowering experience. Each leader will lead a table and you will get an opportunity to talk in a conversation style format (1 leader to 8 individuals) to really learn from their journey, ask them questions and be inspired. 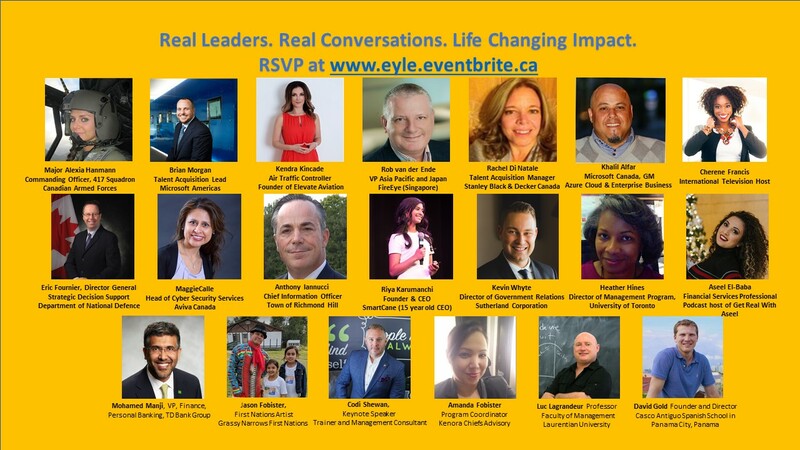 Register NOW at www.eyle.eventbrite.ca as we only have 200 spots for the breakout sessions and we are always SOLD OUT well in advance. Please note, your code for a FREE ticket for Expo Only section is ‘connectwithpurpose’ (while quantities last). Rob van der Ende, Vice President for Asia Pacific and Japan (APJ) at Mandiant, a FireEye company. Joining us from Singapore. Major Alexia Hannam was born and raised in Winnipeg, MB and joined the Royal Military College of Canada immediately after finishing high school. She graduated in 2006 with a Bachelor of Arts Degree in Psychology and a Minor in History. After completing pilot training on the Slingsby Firefly, the Harvard II and the Jet Ranger, she spent seven years at 408 Tactical Helicopter Squadron in Edmonton flying Griffon Helicopters. Major Hannam has been posted to 417 Combat Support Squadron for the past three years and she has completed several rescue missions and deployed on OP LENTUS during the Fort McMurray and BC wildfires as the Detachment Commander responsible for all Griffon support. At 417 Squadron she has been employed as the Operations Officer, Flight Commander, Unit Standards Officer, Training Officer, Unit Instrument Check Pilot, and Unit Flight Safety Officer. She was promoted to Major and took command of 417 Sqn in Aug 2018 as their Commanding Officer. She is heavily involved in Elevate, a non-profit organization for Women in Aviation. She is a mentor to women looking to get involved in aviation or the military as well as a guest speaker. In her free time she coaches the competitive Cold Lake gymnastics team as a volunteer. Mr. Fournier is presently the Director General (Science & Technology) for Strategic Decision Support. He is a Scientific Advisor to the Department of National Defence and to the Canadian Armed Forces. His role is to provide analysis support on policy and strategy, and enterprise resource management to the department. Eric began his career with Defence Research & Development Canada (DRDC) as a Defence Scientist in the Flight Mechanics Group at the Valcartier laboratory in August 1992. He also spent one year at the United Kingdom DERA Fort Halstead laboratory as an exchange scientist in the late ninety’s. In May 2006, he was appointed Director, Science & Technology Air, in Ottawa, where he managed the Air Force S&T Program portfolio. As part of his duties, he also served as National Representative on the Aerospace Systems group (AER) in The Technical Cooperation Program. From September 2008 to July 2009, he moved to the Canadian Forces College in Toronto where he completed the National Security Program 1 (NSP-1). Upon his return to Ottawa, he was appointed Director of Defence Research and Development Canada’s Centre for Operational Research and Analysis (CORA), and was responsible for the delivery of a Science and Technology program in the areas of operational research, strategic analysis, and scientific and technical intelligence. In 2014, Mr. Fournier took up the position of Defence R&D Counsellor at CDLS (London) where he was responsible for liaison in defence Science and Technology between Canada and the United Kingdom, Germany, Netherlands, Sweden, Norway and Denmark. Upon returning to Canada in July 2017, he was appointed DG for Strategic Decision Support, and also selected to develop and lead the implementation of the Innovation for Defence Excellence and Security (IDEaS) initiative. Magali (Maggie) Calle is a Cyber Security and Risk professional with 20+ years of experience in the Financial and Insurance Sector. Maggie is currently the Senior Officer and Head of Security Services at Aviva Canada where she is responsible for continuing to mature and transform Cyber Security Services at Aviva. Maggie has held various senior roles at CIBC, BMO and American Express where she had the opportunity to implement and operationalize large information security and technology solutions solving complex issues and touching many areas of Information Security. During her career, her focus has been software development, identity and access management, application security, vulnerability management, customer protection, network and data security. Maggie is a trusted leader in the IS community who often speaks at security events and conferences. Anthony Iannucci has spent 32 years in creating success for organizations in transformation and continuous improvement through the development of business strategy and alignment with information technology solutions. With a passion for developing and mentoring teams to deliver success for organizations Anthony is currently leading the Town of Richmond Hill through the delivery of a strategic transformation in Information Technology after a long career with North America’s third largest transit organization the Toronto Transit Commission spent primarily in creating greater business alignment with Information Technology solutions. Having worked at KPMG where he completed his CA designation, Mohamed then worked at the Investment Industry Regulatory Organization of Canada (“IIROC”). In 1995, he joined TD Bank Group where he has held numerous executive positions in Canada and the US in Finance, Audit, Retail Banking, Wealth Management and has served as VP and Special Assistant to the President and CEO. He is currently Vice President of Finance in the Personal Banking segment of TD Canada Trust. In addition to his extensive background in banking, Mohamed has worked with boards and committees in both public and non-profit organizations. He currently serves on the Board of Governors of Centennial College and is Chair of their Learning & Education Committee, a member of the Board’s Executive Committee and was formerly Chair of their Audit Committee. Riya Karumanchi, Founder & CEO, SmartCane. Riya is a 15 year-old entrepreneur focused on harnessing technology to better people’s lives and making a positive impact on the world. She was just a “regular kid” until being introduced to entrepreneurship at the age of 12 through an amazing organization called ZeroToStartup, which taught her the fundamentals of entrepreneurship and engineering. There she formed a team who are currently working to introduce Smart Streetlights in Toronto and is currently the youngest member of the Social Ventures Zone at Ryerson University. After having a chance encounter at a friend’s house with their visually impaired grandmother seeing the challenges she was facing, it pushed her to come up with a solution to help enable independence and mobility. She currently has a startup company, SmartCane, an assistive device for orientation and mobility for the visually impaired. The SmartCane is an enhanced version of the 100 year-old stick that was never updated to take advantage of new technologies. The device leverages technology to increase independence and safety through GPS integration, object detection, and AI object classification. Her team is working towards SmartCane’s vision to integrate with cities to enable accessibility and autonomy when travelling. Starting as just a science fair project, her team has now received over $51,000 in funding and in-kind services, with assistance from companies like Microsoft, Inertia Engineering, Arrow Electronics, ICUBE & UrTech. Her entrepreneurial journey has been an incredible learning experience! She is working hard to further develop her skills and is both grateful for the help and encouragement she’s received and is excited for her journey ahead. Brian Morgan is currently the Talent Acquisition Lead Microsoft Americas responsible for continuing to grow and transform the way Microsoft brings great talent into the organization. During his 18+ year career in human resources, Brian has had the opportunity to touch on all areas of HR. His focus over the years has been around organizational development, employee relations, change management, executive development, coaching and most recently recruiting. Brian started his career in the pharmaceutical industry, holding various roles with Biovail Corporation and then moving to Kendle International where he was HR Director for their Early Stage Research division, supporting clinical research units in Canada, United States and the Netherlands. Brian holds a Bachelor of Commerce (Human Resources) from Ryerson University and is a Certified Executive Coach from the Hudson Institute of California. Aside from this, Brian’s most important roles are that of husband, father, son, brother, uncle, cousin and friend. Identifying and creatively seeking Talent has always been a passion for Rachel Di Natale throughout her career. As the Talent Acquisition Manager with Stanley Black & Decker Canada Inc, Rachel applies her Talent Evangelism to help the organization grow and flourish. She has spent the past 15 yrs in the Talent Acquisition arena working in a variety of industries including Technology, Not for profit, Construction and Consumer Packaged Goods focusing on identifying, sourcing, attracting and connecting extraordinary Talent with current and future business needs. When her TA hat is off for the day she spends her time as a Mom, Wife, Daughter, Friend and Mentor coaching her family through this wonderful experience of life always looking to be the best we can and making a difference in the lives around her. Leads the business strategy, Profit & Loss, scorecard metrics, and investments for the Cloud and Enterprise business. Heather Hines, a Quebec native, has degrees in history and education as well as a Masters in Educational Administration from McGill University. Her work has taken her to Japan, where she taught English for two years, as well as to post-secondary institutions both in Quebec and Ontario. Through her roles and over 20 years spent working in the university sector, Heather has been able to cultivate her strong interest in experiential education, student support and curriculum development and enhancement. In addition to her formal role, Heather is a dedicated volunteer. She has served as a staff representative in university governance groups, is currently a mentor in the University’s Leadership Mentoring Program and also serves as a Steering Committee member for Connections & Conversations, an affinity group for racialized staff. Outside of the post-secondary environment, Heather is a member of Optimists International where she works to support youth in the community. She currently serves as the Best Practices rep at her daughter’s high school and recently finished a 6 year term as the school’s Eco Rep. Lastly, she made a foray into the world of book publishing, when she helped fulfil her father’s lifelong dream of producing a book about his childhood experiences with his maternal grandmother in Jamaica. Heather loves to learn, is excited about new ideas and trends and enjoys meeting young people and talking about their hopes and dreams. She is excited to be a part of this year’s Expo. Rob van der Ende is Vice President for Asia Pacific and Japan (APJ) at Mandiant, a FireEye company. He is joining us from Singapore. He sets strategic vision across the region, develops and drives revenue for new and existing service lines, provides leadership, development and support to the team of Incident Response and Forensics experts and Security Services consultants and has ultimate responsibility for customer engagements in the region. Mr. Van der Ende holds seats in several executive committees and is a frequent speaker at industry events across the region. Prior to FireEye, Rob was Director for Cybersecurity & Public Sector across Asia within the Enterprise Services Business unit of Microsoft Corporation, where he successfully led the expansion of Microsoft’s Cybersecurity and Public Sector Solutions and Services across the geography. Before that, he held responsibilities as Vice President for Consulting (APAC) at Oracle Corporation and Executive Director at Electronic Data Systems in APAC and EMEA. Rob was born, raised and educated in The Netherlands, then held IT management roles for several Dutch multinational organizations covering business across most European countries, before relocating to the Asia Pacific region in 1999. He currently lives in Singapore and thoroughly enjoys his exposure to the cultural and cybersecurity diversity during his travels across the Asia Pacific and Japan region. Kendra Kincade: Speaker, philanthropist, air traffic controller, there is no doubt that Global Woman of Vision award winner, Kendra Kincade is a true inspiration, a beautiful reminder to us all that it is possible to intentionally change your life and live your dreams. Overcoming a decidedly challenging early life which left her dejected and disillusioned, a single mother raising 4 children, Kendra discovered quite by accident that the pathway to her own salvation lay in helping others find theirs. She enthusiastically embarked upon her quest to make a difference, fundraising for worthwhile organizations, even climbing Mt. Kilimanjaro to raise money for a local hospital. Soon, she was heading up her own nonprofit organization, Changing Stories, and choosing her own projects such as the construction of a sports playground in El Salvador and a classroom in Nicarauga. Her longtime career as an Air Traffic Controller opened up more horizons for the aspiring young woman, literally as well as figuratively, when Kendra, recognizing the negligible female presence in the industry, set out to remedy the situation. Now the Founder and Board Chairman of Elevate Aviation, a venture dedicated to uniting and empowering women in aviation, she is passionate about providing opportunities for women of all ages to attain knowledge and training in all its related professions. Kevin Whyte works in the government relations field and is currently employed as the Director of Government Relations with Sutherland Corporation. Kevin is active in engaging all levels of government for various clients, some of which include tech and infrastructure companies, a union, developers, and a global security firm. In his role, Kevin is responsible for building and maintaining positive, constructive relationships with elected officials at all levels of government, and their staff, to ensure that the interests of Sutherland’s clients are attended to and new opportunities are made available. Kevin previously worked at Habitat for Humanity Halton-Mississauga as the Manager of Government Relations and Special Projects. He emphasizes community involvement, learning from failure rather than dwelling on it, and employing a positive attitude when taking on difficult tasks. Cherene Francis is an International Television Host, Producer and Personal Branding Consultant who helps entrepreneurs craft their message and confidently market themselves through television, video & online marketing, so they can grow their following, attract more opportunities and get more clients. Cherene’s superpower is energetic communication; the key ingredient that her clients use to inspire, influence and impact. She has formal education and experience in Personal Branding, Marketing, Image Development, Stage Performance, Religious Studies, and Philosophy. She is also an Internationally Board Designated Institute and Trainer of Hypnosis, Master Practitioner of Neuro-Linguistic Programming, Master Practitioner of Time Line Therapy and Master NLP Coach. When Cherene isn’t interviewing entrepreneurs on her television show, teaching in business circles, or serving at community churches, you can find her watching Netflix at home with her husband and two daughters in Toronto, Ontario, Canada. Connect with her at ChereneFrancis.com. Aseel El-Baba is an empowered woman fueled by passion to inspire, to motivate, and create an impact in the world. She holds various degrees and certifications in the Financial Planning Industry. She currently manages a portfolio of clients where she helps them with their investments and financial needs. She is pursuing her training in Psycotherapy, eager to learn more skills to help others navigate various life transitions. Aseel has her own empowerment podcast called Get Real With Aseel, found on Itunes, Podbean and Youtube (getrealwithaseel.podbean.com). David Gold, is the founder and Director of the Casco Antiguo Spanish School in Panama City, Panama. The only language school located inside the UNESCO world heritage site of Casco Viejo, it organizes Spanish language immersion programs and volunteering placements in local non-profit organizations for everyone from ambassadors and CEO’s of multinational corporations to backpackers, families, and university groups. Founded in a community center, the school partners with non-profit organizations that work with at-risk youth, women, art, and dance to help students practice their language skills and give back. David studied International Development at McGill before working as a US Peace Corps volunteer in Bolivia on small business development with rural women’s cooperatives. After the Peace Corps he taught 4th grade in Bolivia before relocating to Panama and starting the Casco Antiguo Spanish School. Luc Lagrandeur is a Professor in the Faculty of Management at Laurentian University (Sudbury, Ontario) teaching courses in marketing, case analysis and competitions, business venture creation, business launch and business consulting. Luc has 10 years of practical marketing experience; he held positions such as Strategic Account Manager, Marketing Manager and Manager of Customer Relations for one of Canada’s largest information technology outsourcing company based in Montreal. In December 2013, he completed an executive DBA (D3C) in e-business at Université de Sherbrooke. He is currently pursuing doctoral studies (PhD) at University of Lille in France. His interests focus in the fields of e-marketing for businesses & local governments, and management & leadership education. His current research projects are 1) on the implementation strategies of local government offering e-services using the virtual organization model; and 2) the impact of online municipal services at the organizational level (efficiency) and the relationship and interaction level with citizens (efficacy). Jason Fobister is an incredible First Nations artist from the Grassy Narrows First Nations community, almost 2000 km away from Toronto. Jason and has wife Crystal are working hard to support their community and to make the world aware of the incredible culture of our first nations. They are also working hard in their own community to support youths through conversation, art, expression and being great role models. During a recent visit to Grassy Narrows First Nations, Sultan the CEO of Experience Your Life and his family met Jason. At the invitation of Sultan’s daughters, Jason graciously accepted to fly 2000 km and support the Expo through this presence. This is an incredible opportunity for youths in the GTA to gain a better understanding of First Nations culture and meet an amazing artist whose spiritually and soul will rock you. Worked at the NeeChee Friendship Centre as the Wasa-Nabin Youth Program Coordinator for 3 years, working with At Risk Urban Aboriginal Youth aged 13-18, developing culturally relevant programs that offered support and services in a broad range of areas. Miss Fobister has worked extensively with First Nations people on and off reserve including acting as the Dental Health Promoter in her community of Grassy Narrows, and Dental assistant in an urban setting for 7 years combined. Enrolled in the Teacher Training Program while working at the Grassy Narrow School offered by Lake Head University and subsequently enrolled at the University of Manitoba where she completed her Bachelor of Arts Degree with a Major in Psychology, and Minor in Native Studies. Miss Fobister then obtained her Certification in Applied Behaviour Analysis, specializing in behaviour modification, and worked in the Psychology Department at the St Amant Centre in Winnipeg, Manitoba. Her most highly regarded experience however, was in 2008 when Miss Fobister spoke at the United Nations in Manhattan, New York City regarding environmental issues in her community, at the “Conference on Indigenous Peoples and Climate Change”. Codi Shewan brings over 20 years of fast-paced, hyper-growth in the corporate world and has become a recognized authority in leadership and business, guaranteed to engage audiences from the moment he steps on stage, always ensuring they are equipped with takeaways they can immediately put into practice. Named by Blueprint as a ‘Future of Work Thought Leader’, his ability to be a trend-spotter has catapulted the success of his management consulting agency, where he advises leading brands and organizations on the key shifts happening around people management, change and innovation, leadership, and the future of work. He accepts full blame for inspiring teams, accelerating performance, and achieving world-class results. Using real -life examples and results-driven insights, Codi gives leaders and their teams the tools to achieve a sustainable competitive advantage in their profession.